Join the discussion on our forums! Come discuss Grimestreet Informant over in our dedicated Grimestreet Informant discussion topic. "Naw, naw. You're talkin' about Grime BOULEVARD. I ain't know nuthin' 'bout that." The poll is flipping me off! Wait until the Goons can do it themselves. Discover cards are so slow against aggro. Hunter with Divine Favor PogChamp! Well, more buffs to Steward of Darkshire. This is a really strange combination of classes for which cross-over cards are generally not going to work all that well. Paladin has a lot of pretty bad spells clogging up the options, hunter has mostly aggro/tempo cards and synergy cards that won't work well outside of hunter, warrior has its armor synergy and conditional cards with damaged minions which paladins and hunters won't be able to make very good use of. There might be edge cases like picking up a Savannah highmane, Truesilver Champion or Brawl, but I expect that a lot of the time you'll be forced to pick the least useless card of the bunch and not one that's actually good. It's no wonder that they made this the cheapest of the discover cards. I disagree. So much weapon, minion, and spell potential here. Sure I'll take Grommash Hellscream or Tirion Fordring . 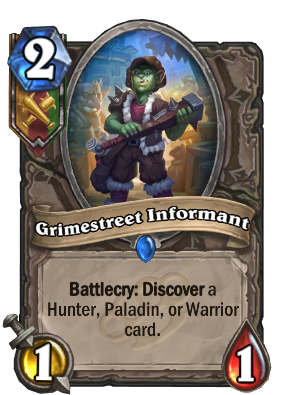 Yes, when you play Grimestreet Informant you can choose from 3 cards: A Hunter, Paladin or Warrior card. Finally we can have Starving Buzzard, Eye for an Eye and Cursed Blade in one card. Surprisingly enough, Eye for an Eye and Cursed Blade actually synergizes. It doesn't need to. Enemy hits your face for five. It deals ten instead because of cursed blade. Secret triggers and gives him ten too. I forgot how Cursed Blade actually works. terrible card in constructed. Wow, they combined the 3 classes that have the most garbage class cards if chosen randomly and made a 2 mana 1/1 Discovering a card from those three classes. Yay, Hunters and Paladins with Execute! Hunters with Sword of Justice! Warrior with Call of the Wild or Happy Rag!